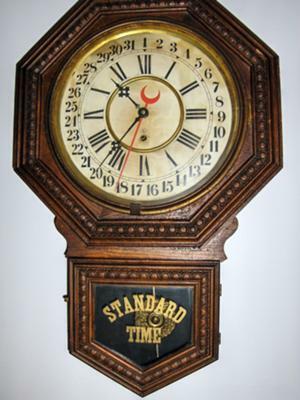 This particular timepiece hung in my families' general store for as long as I can remember. It was passed from my Great Grandfather to my Grandfather to my Father to me. It was manufactured by Wm. L. Gilbert Clock Co, Winsted Conneticut. This I know from the instruction label glued to the back of the clock and it is also printed on the face of the clock at the bottom. This clock has days of the month on the front as well as the Roman Numerals for the time. I am interested in knowing the year of manufacture as well as any other pertinent information you may have pertaining to this clock. I will try to send a picture of the clock as well.